Another Friday night at work. This one wasn’t so bad because it was all overtime and I only had to work half a shift. I was able to stay home with my family all day then start my work day from Kalamazoo at 6:00. That short work day stretched to just past 10:00 and ended in Parchment. I hadn’t had time to stop and eat dinner and I knew there was a pizza place downtown. A football game had just gotten over at the high school, so I was hoping the town’s only pizza joint would still be open. Geno’s Golden Pizza & Pub is in downtown Parchment on Riverview Drive just south of Parchment Middle School. The business takes up what looks to be two storefronts with a large dining room past a smaller dine-in area that also has the order counter. I called my order in while I was getting gas down the street then just sat outside and played Candy Crush on my phone while I waited for my pizza to cook. J and I had Geno’s several years ago when they expanded in to Kalamazoo for a short time. 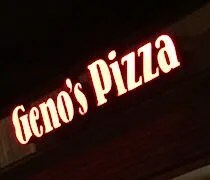 There used to be a Geno’s Golden Pizza in Campus Pointe where part of AFB is now. That closed several years ago and we only ordered pizza from there once, so I didn’t really have much of a recollection of the pizza going in to this experience. 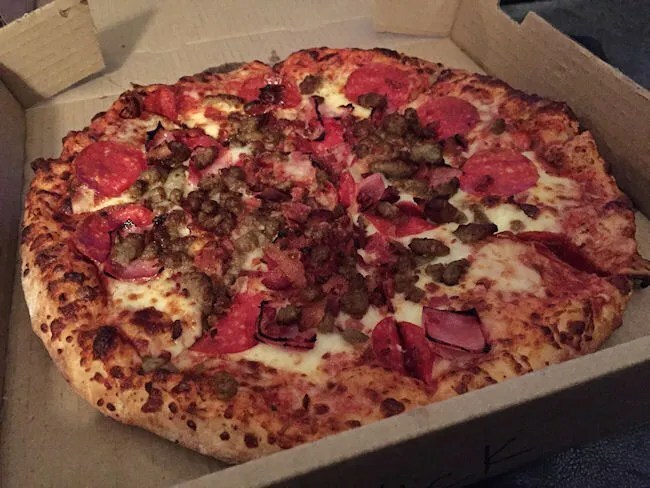 I had put in my order for a 12″ All Meat pizza. I was heading home to a house of sleeping people, so there would be no sharing. That meant I could get whatever meat I wanted on my pizza…..so I got them all. The cost was a little over $14 and it was hot and waiting for me when I walked in to the shop just over 20 minutes after ordering. I took the pizza home because I still had some things to do for work and I planned on having a beer with it. I could have done that at the restaurant because they actually have a pretty large selection of craft and domestic bottles on hand. The “pub” part of the restaurant has been added on recently although I’m not 100% certain when they started selling beer. The pizza was pretty standard for what most people consider “delivery” pizza. It had a pretty thick crust with a really sweet sauce that went perfectly with all the salty meats on the pizza. Pepperoni, bacon, beef, ham, and sausage were all in play, but it was the spicy sausage that really stood out. There was saltiness from the ham, but the spicy was just delicious. 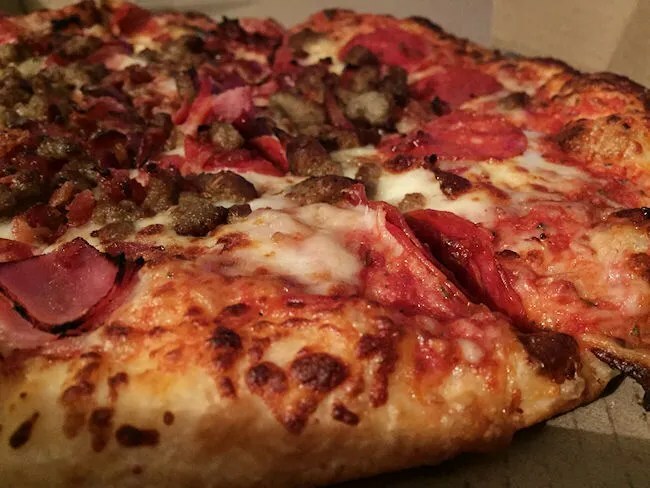 I don’t normally order sausage on my pizza….mostly because my dad and brother prefer sausage so to spite them, I always ordered pepperoni….but I would definitely consider it as a solo topping when ordering in the future. Geno’s was good. It didn’t really have any stand-out qualities that would make it a “gotta have it” for me (I typically prefer thin, crispy crust pizzas), but it’s a fantastic pizza place to have in your hometown. The locals seem to love the place…and they’ve been in business for over 40 years so you know they’re doing something right. 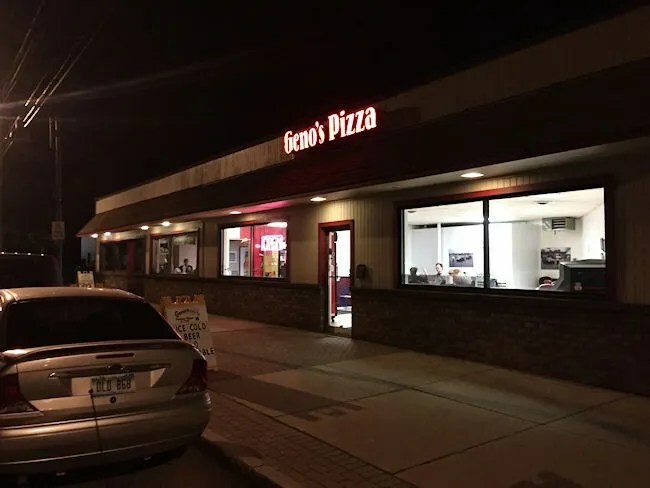 I’m not in Parchment often, but I have been there enough to know that Geno’s was there and it’s always been on my list of pizza places to try. It one that I would visit again should my travels take me back to this part of Kalamazoo County.